On all four sides of the allotment are hedges now with a mixed cotoneaster, holly, hawthorn,bramble, rosehip and some other bushes I can't name at the top end (one of which has beautiful yellow flowers), and also a hazelnut tree filling in a gap on one side and privet/hawthorn around the rest. Last year, we had a blackbird nest in one hedge, the sparrows in the middle of the hawthorn at the top and a robin nesting in the hazelnut tree. Not quite as busy this year, sparrows down the bottom and a blackbird nest at one side. 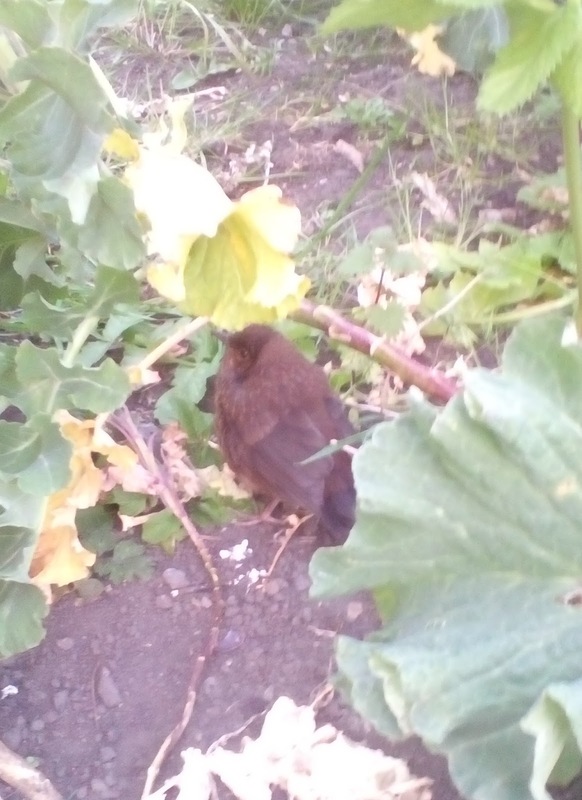 Now, there were a pair of blackbirds early on going into the hedge but of late, since the chick has left the hedge, it only seems to be the male that is feeding the fledgling. Here's the fledgling, as is usual with young birds they just sit around look very sorry for themselves and a little bit helpless, but of course it is better to leave them alone for their parent to find them. As happened in this case, the male blackbird came and worked its way down the allotment making a gentle calling note until eventually the little one caught sight of it and clumsily flew into the damson tree to have a catch up with Dad! Around the allotments at least one other blackbird pair have nested, there was a young mistle thrush this evening (last year both mistle and song thrushes fledged young, as well as dunnocks, and robins and maybe a pair of linnets that hung around from Spring). The swifts are whizzing around as well now, from just 5 two nights ago to 9 last night and now 25+. Some house martins around as well but for swallows you have to go to the next villages and for sand martins down to the river. No bats yet, there's usually at least one or two as it goes dark down the allotment path. When last season still hasn't finished..